Red walls create an impact and are most commonly interpreted on dining room, library, or powder room walls. When artfully paired with surrounding elements it can command a presence or provide a warm embrace. We can dine in its company or get lost in a novel. 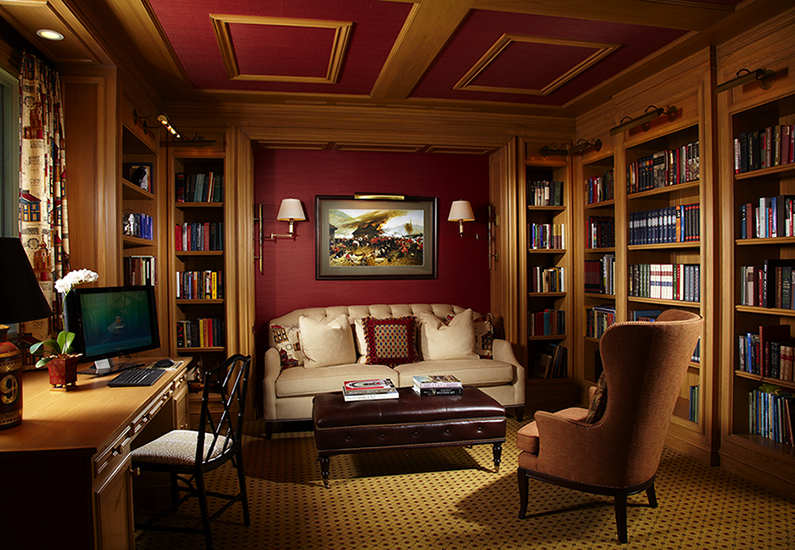 Nothing is more classic than a wood-paneled library, leather book bindings, matched with a soothing shade of red on the walls and possibly ceiling as seen in this library using a Phillip Jeffries grass cloth wall covering. Red is warm and intimate, strong and commanding, rich and full-bodied. Yet, red must be approached with intention. Be thoughtful when selecting complimentary colors and tones. Red is radiant alongside its color neighbors fuchsia and purple, adds impact with neutrals and wood tones, but it can vibrate next to greens. It is equally important to note the color temperature of any shade of red, whether it is warmed with yellow-orange or cooled with blue, and then pair with its complimentary hue.